What Qualifications Are Needed To Teach at a Community College? People who would like to instruct older students may want to know what qualifications are needed to teach at a community college. A person may not want to work in a full-fledged university, but instead prefers to work in a small, local community college. The following looks at the requirements for teaching at a community college and shares some important details on this sort of career. A person interested in teaching at a community college doesn’t need to have a PH.D. A person with a master’s degree is able to teach courses there. Many courses offered at a community college have a particular focus while a university offers lots of general courses. For instance, a student at a community college may take a course on animal care in order to become a veterinarian’s assistant. Or, a person can take a course in accounting to prepare for a career in that field. An instructor with a master’s degree as well as experience in a certain field of work is a good candidate for a teaching job at a community college. A person who receives a position as a teacher at a community college will be teaching a variety of students. Many working adults attend community college courses when they want to change careers or progress in their present job. Also, students out of high school who want to specialize in a particular career attend community college courses. They want to avoid the general courses that they would have to take in order to graduate from a university. 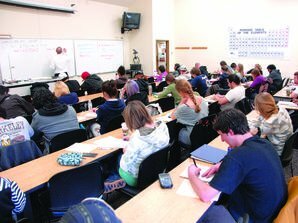 A teacher in a community college must be willing to teach students of different ages who come from a variety of backgrounds. Many post secondary teachers find this to be a welcome challenge, according to the Bureau of Labor Statistics. Of course, a teacher at a community college must teach all of his or her assigned classes. Also, a teacher has to take the time to grade assignments, conference with students and write lesson plans. Some classes are held in the evening to accommodate the schedules of adult students who work. Other classes are held during the day, just two or three days a week. A teacher may receive a different work schedule each semester. A teacher must be knowledgeable about his or her subject matter. A person with a master’s degree who has worked in the nursing field would be an excellent teacher for students who want to pursue a career as a nurse. This person would be able to communicate personal stories and inside knowledge to a class of students. These things can be powerful teaching tools. A teacher must also be patient and dedicated to making students understand a topic. A teacher should also have lessons as well as his or her materials organized for each class. A disorganized teacher can cause a delay in the start of class or convey a confusing lesson to students. Finally, a teacher at a community college must be willing to teach each course to the best of his or her ability. Just because a person doesn’t need a PH.D. to teach community college doesn’t mean the students deserve a substandard education.